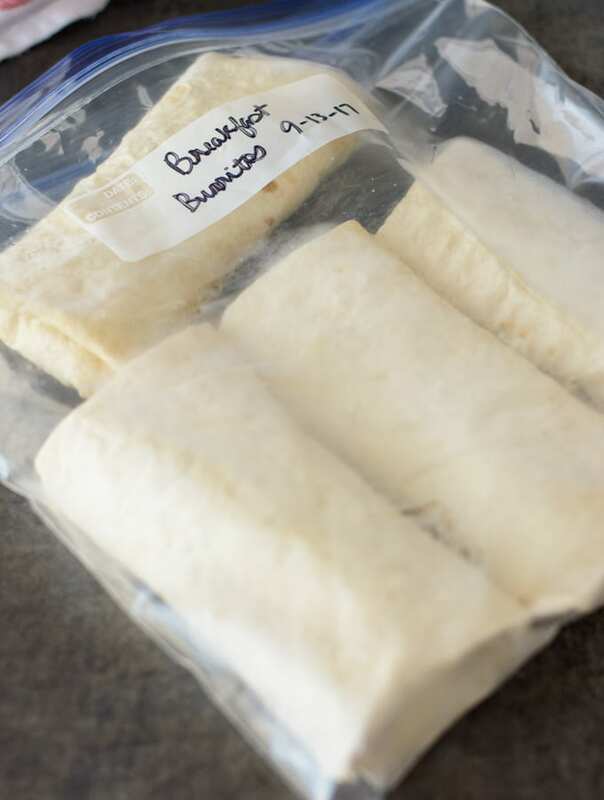 These Freezer Breakfast Burritos are easy to make and great for super busy mornings. 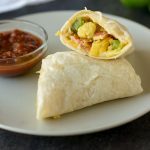 These make-ahead breakfast burritos are the perfect way to enjoy a hot and delicious meal before you start your day! I don’t know why I didn’t think about coming up with a breakfast burrito recipe way before I did. They are so great to have on hand, and SO simple to make! Once you get all of the ingredients prepped and an assembly line formed, these come together super fast. You can have ten burritos made in no time! Have a large sheet pan lined with parchment paper ready to go before you start making the breakfast burritos. Spread a little cheese down the middle of the tortilla. Add half a cup of the egg mixture. 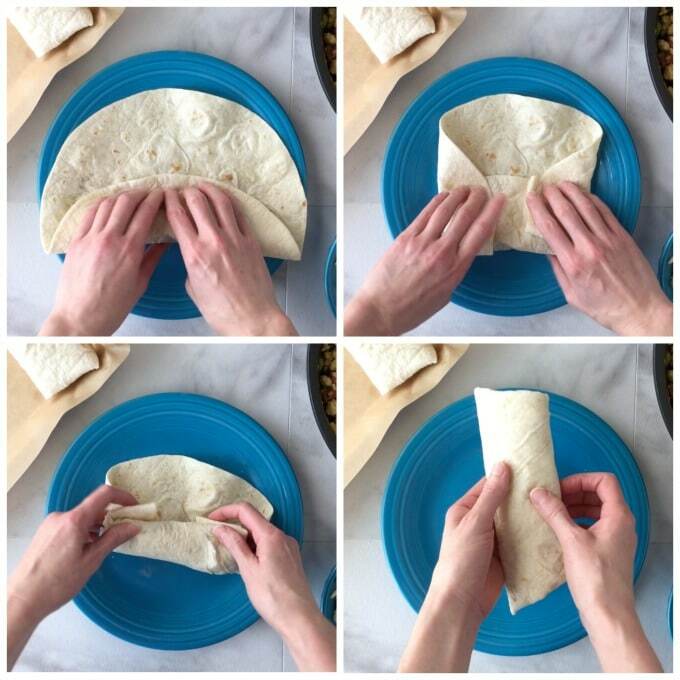 Fold the bottom half of the tortilla over the filling and pull back gently, then fold then ends in. Roll the bottom half (the end nearest you) up the rest of the way. Place onto your prepared tray. Put the tray into the freezer and freeze until firm. Then, pop them into freezer bags and put back into the freezer. If you don’t like sharp cheddar cheese, you could substitute it with one of your favorite flavors of cheese. I think Colby Jack or Monterey Jack would also be tasty in these. You want large (burrito-size) tortillas to make these, not the smaller kind. Look for some with the cleanest ingredient list you can find. Reheat as needed. I wrap mine in a damp paper towel and heat in the microwave for about 90-95 seconds (1000 watt microwave), turning over about halfway through. Want More Portable Breakfast Ideas? 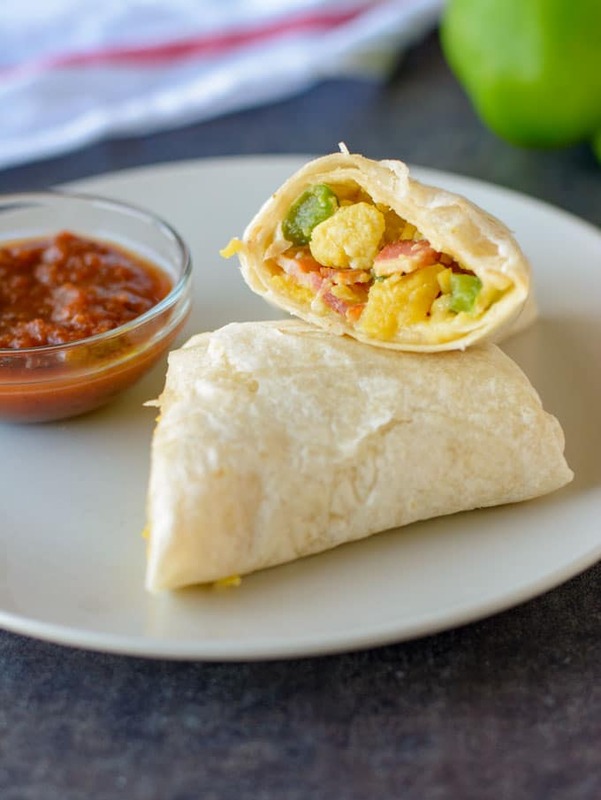 These Healthy Freezer Breakfast Burritos take the stress out of early morning days! They are the perfect tasty and portable breakfast! In a large frying pan, add the bacon. Cook over medium heat until brown and crispy, about 8 minutes. Transfer to a paper-towel-lined plate and set aside to let cool. Remove all but about 2 tablespoons of the bacon fat from the pan and set it aside. Once cool, chop the bacon into small pieces. While the bacon is frying, whisk the eggs, milk, salt, black pepper and garlic powder together in a large measuring cup or bowl and set aside. Add the chopped bell pepper to the skillet with the bacon drippings, and let cook until they begin to soften, about 3 minutes. Pour the egg mixture into the skillet and let the eggs cook, scraping the bottom of the skillet with a spatula and turning the eggs over occasionally, until they are scrambled. Be careful not to overcook because the eggs will be reheated later. Add the cooked bacon to the scrambled eggs and gently mix together. Remove from heat and let cool to room temperature. Meanwhile, place a sheet of parchment onto a large baking sheet. Set up an assembly line of cheese, egg mixture and tortillas. Heat another large skillet over medium heat and heat each tortilla for about 30 seconds, flipping half-way through. This is to help make the tortillas more pliable and less apt to break when folding. Place 2 tbsp of cheese onto each tortilla, top with about 1/2 cup of egg/bacon mixture. Be sure to leave plenty of room on each end so you can fold it. Fold the bottom half of the tortilla over the filling and pull back gently, then fold then ends in. Roll the bottom half (then end nearest you) up the rest of the way. Place onto parchment paper-lined cookie sheet and continue the process until all the burritos are made. Place sheet pan into freezer and let freeze until the burritos are solid and firm. Then, place into freezer bags and put back into the freezer. To reheat (for 1 burrito), wrap a damp paper cloth around the burrito and place into the microwave for 60-90 seconds, turning halfway through, or until filling is hot. 1. It's very important that you let the filling cool, so that the burrito does not get soggy. 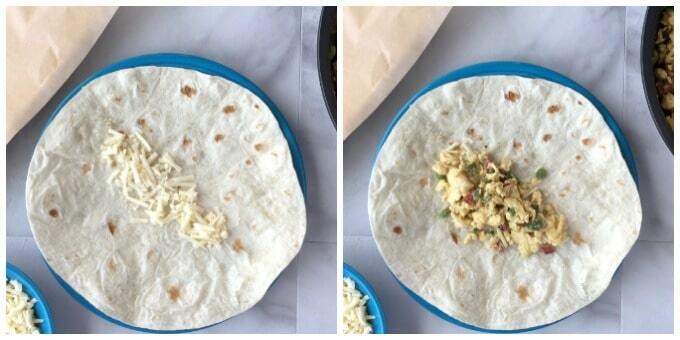 The cheese also helps separate the moist eggs from the tortilla. 2.If using turkey bacon, you will need to add some type of cooking oil to the pan before you add the bell pepper since the turkey bacon is leaner. 3.Reheating in my 1000 watt microwave takes about 90-95 seconds. Be sure to turn halfway through. 4.I used Pederson Farms (Whole 30 Approved) Sugar-Free bacon for my recipe, so the nutrition facts are based on that. Sugar content will vary depending on bacon used. 5. These nutrition facts are based on 10 servings of 1 burrito. By Tempie at November 18, 2018 .